“It’s a win-win for everyone involved,” says Waseem Ghannam, MD, MBA, a founder of TeleHealth Solution. unnecessary trips to the Hospital. 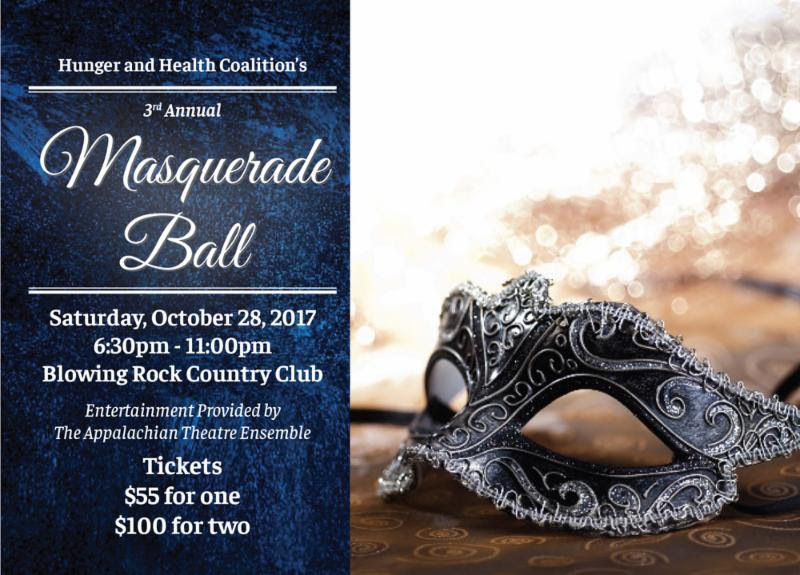 The Hunger and Health Coalition is bringing back our Masquerade Ball for year three! The last two have been downright stellar, raising over $20,000 for the HHC’s programs to help those in need in our community. Heavy hors d’oeuvres will be served, along with a cash bar! The costumes, dancing, drinks, and performances from Appalachian Musical Theatre Ensemble will all be back too, plus visits with fortune tellers and tarot card readers, and even more surprises and twists! OR buy a mask at the door! We’ll also have a raffle with some amazing items not to be missed! This year we’ll be hosting the event in the grandeur of the Blowing Rock Country Club. Purchase your tickets in advance here, and call Elizabeth Young at 828-262-1628 if you’d like to volunteer or become an event sponsor! On Saturday, November 11th, 2017 Blue Ridge Women in Agriculture will join with The Organic Growers School to host this fundamental workshop in Boone, NC at the Watauga County Agricultural Center. “The Farm Dreams workshop is helpful in refining your vocational vision, planning a strategy for pursuing your vision, and establishing connections in the farming community,” stated a 2016 participant. Nicole DelCogliano is the OGS Farmer Programs Coordinator. She and her husband Gaelan began their farm Green Toe Ground, a diversified organic farm in Celo, NC over 14 years ago. They’ve grown the farm over the years, and now manage 16 acres of diversified organic and biodynamic produce and livestock, train farm apprentices each year, and raise their two girls. Originally from NY, she has farmed and worked in education in NC for the last 20 years. She earned a Bachelor’s Degree in Anthropology from State University at New Paltz in New York, and has a Masters in Sustainability from the Center for Appalachian Studies in Boone, NC. Kathleen Petermann is the farmer and operator of Waxwing Farm, first started in 2012 at the Farm Incubator and Grower (FIG) Project farm in Valle Crucis. In 2014, Kathleen moved to the site of Maverick Farms to manage the land as Waxwing Farm. She farmed veggies by herself for two years until she met Francis Mangogna, a recent Atlanta transplant and local farm intern. They began farming together in 2016, adding livestock and expanding cut flower production. Kathleen graduated from Appalachian State University’s Sustainable Development Department with a degree in agroecology. Kathleen and Francis are first-generation artists-turned-farmers, lovingly working small pieces of land and caring for animals in the beautiful mountains of Western NC. Julia McIntyre owns and operates a local micro farm and vacation rental home in Boone, NC with her husband, John. Julia retired from a 30 + year career in the global high tech industry and began working on their farm full time in 2015. Julia managed 2 farmers markets in Watauga County during the 2017 growing season, including starting Boone’s new weekday farmers market, the King Street Market. As they build toward a sustainable farming and value added food business, Julia and John are partnering with the Health Department and are looking for new ways to strengthen and support the local food system by taking their mobile farm cart into food desert areas in and around Boone. The Chapel of Rest will host the Jeff Little Trio in concert on Sunday, October 29 at 4pm in Historic Happy Valley, followed by a BBQ chicken and pork supper on the grounds at the Chapel. The concert is sponsored by Bernhardt Furniture Company and the Chapel of Rest Preservation Society, and is held, in part, as a celebration of the North Carolina Arts Council’s 50th Anniversary, which is being celebrated state-wide during October. Jean McLaughlin, former Director of Public Art for the NCAC and current Executive Director, Penland School of Crafts, will speak briefly to introduce the Trio. With few exceptions, the piano does not play a prominent part in Appalachian music, and is rarely the lead instrument, but Jeff Little is an exception.” His lead solos are breathtaking in their speed, precision and clarity,” according to the National Council for the Traditional Arts. Jeff’s involvement with fiddle tunes, old time music and traditional blues dates to his growing up in Boone, where his family owned a music shop. The shop was a regular gathering place for musicians including Doc Watson, who would stop by to pick a few tunes, and at an early age, Jeff would regularly sit in with many of them. These influences helped shape Jeff’s approach to the piano. Steve Lewis, award winning guitarist and banjo player from Todd, NC and Josh Scott, upright bass master from Fleetwood, NC complete the Trio, and they travel the country with performances including the Smithsonian Institution, The National Folk Festival, American Piano Masters and Merlefest. They have also toured around the world on U.S. Government Goodwill Tours to Sri Lanka, Bahrain, Oman, France and Tanzania. Jeff has released four CDs, and has been featured often on National Public Radio and PBS. In 2014 he was inducted into the Blue Ridge Music Hall of Fame, and this concert is presented in conjunction with the Blue Ridge Music Trails of North Carolina. The young musicians of Blackberry Jam will greet folks as they arrive for the concert. They are a six-member stringed instrument group who have evolved from the Junior Appalachian Musicians (JAM) Program at the Caldwell Arts Council. JAM was founded in Sparta, NC in 2000, and is now in over twenty counties in NC, SC and Virginia. The musicians will be Dawson Clark/ banjo and Lincoln Clark / guitar, Kemdyn Clement/fiddle, Dalton Signon/guitar and Averi Sigmon/ mandolin, and Gideon White/ bass. Bob Henson is strings instructor for the group, and is assisted by Alyssa McLean. Admission to the concert is $15/ person, and the BBQ supper is $15 / person. Reservations for the BBQ supper must be made by contacting Bill at [email protected]. The Chapel of Rest is located nine miles north of Lenoir at # 1964 Highway 268, adjacent to the Patterson School campus. Proceeds from the concert will be used for the continuing maintenance of the Chapel, and doors will open at 3:30 pm. The Wilkes Heritage Museum host Candlelight Ghost Tours this Saturday, October 21st. Ghost tours are 90 minute walking tours that begin at 7:30pm, 8:00pm and 8:30pm and are led by costumed guides. Cost is $10 per person. Highlights of the tour include the Old Wilkes Jail, Cleveland Cabin, Tory Oak site and the Presbyterian Cemetery. Learn all about the hauntings of Historic Downtown Wilkesboro. An additional date for the 2017 Candlelight Ghost Tour season includes October 28th with tours beginning at 7pm and 7:30pm only for this date. Reservations are encouraged. Due to construction in downtown Wilkesboro, the check-in for ghost tours will be along North Bridget Street beside the Wilkes Heritage Museum. Parking is available along Main Street and in the public parking lot behind Stroud Miller Insurance off of South Bridge Street. BOONE, N.C. – Appalachian State men’s basketball is set to compete in the 2017 Puerto Rico Tip-Off at Myrtle Beach in Conway, S.C. on Nov. 16, 17 and 19. All-session tickets are set to go on sale at Noon ET on Thursday, Oct. 19. Single-session tickets are to go on sale beginning Nov. 3. All-session tickets grant access to all six sessions that include a total of 12 games at the HTC Center on the campus of Coastal Carolina. These tickets are available for $99 plus tax until Nov. 3. At that time, the addition of single-session tickets will become available based on availability. This option includes admittance to one session, or two games, for $35 plus tax. In addition to tickets, travel packages are available through Anthony Travel. Check here https://www.anthonytravel.com/prto-tip-off/ to see current accommodations after the relocation of the tournament to Conway, S.C.
Appalachian State will open the tournament with a 5:30 p.m. game against Iowa State on Thursday, Nov. 16 to be aired on ESPNU. For more information on the 2017 Puerto Rico Tip-Off at Myrtle Beach, visit https://espnevents.com/puerto-rico-tip-off/. To purchase all-session tickets, visit https://www.ticketreturn.com/prod2/team.asp?SponsorID=10299#.Wei_EHXyu3U.